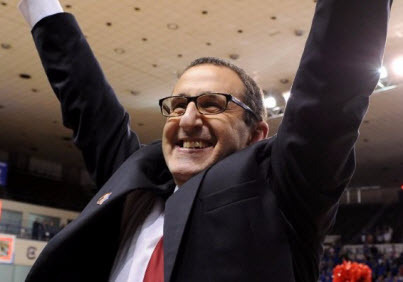 Jim Jabir has been named Florida Atlantic University’s head women’s basketball coach. Jabir’s coaching achievements have twice earned him recognition as a finalist for the National Coach of the Year Award. He will be the fifth coach to guide the Owls program. At UD, Jabir led his teams to six-consecutive NCAA appearances (2010, 2011, 2012, 2013, 2014, 2015) including the program's first NCAA Regional Final in 2015, two post-season Women's National Invitation appearances, three-consecutive Atlantic 10 (A-10) Finals, the program's first A-10 Women's Basketball Tournament title in 2012, followed by the program's first A-10 Regular Season Championship in 2013. In 2014, Jabir led the Flyers to another A-10 Regular Season crown. Under his guidance, 27 players were named A-10 All-Conference performers while the Flyers undoubtedly enjoyed their program’s most successful stint in modern program history. In one of the program's most successful seasons, Jabir led the Flyers to the Elite Eight® in 2014-15 with NCAA Tournament wins over Iowa State, No. 11/11 Kentucky and No. 8/8 Louisville before falling to eventual national champion No. 1/1 Connecticut. Dayton ended the season ranked No. 17 nationally in the final USA Today Coaches' Poll. At seasons’ end, graduating seniors Andrea Hoover and Ally Malott were each selected in the 2015 WNBA draft - Malott became the program's first WBNA selection as the eighth overall pick while Hoover was chosen 31st. Prior to UD, Jabir was at the helm of Providence College for six seasons, 1996-2002. During his last three years with the program, the Friars' record improved with each season. He also spent six years at Marquette University elevating the Golden Eagles into the national spotlight and became one of the most successful coaches in the history of the program. He began his coaching career as an assistant at Nazareth College (1984-85) and at Buffalo State (1985-86). Jabir was instrumental in leading the Bengals to a 23-3 slate, the SUNYAC title, a 22-game win streak, an NCAA Regional Tournament appearance and a national ranking (No. 3) during the 1985-86 season. Jabir served as the head coach of the Siena Saints for three seasons (1987-90) and compiled a 50-29 record. Jabir's teams posted three-consecutive winning seasons.